The steady stream of old gardening books showing up in my mailbox and on my doorstep has slowed down to a trickle now. I believe I am expecting just two more books, unless of course, I discover another gardening book that I could not possible continue without. I offer assurances to those who have some idea of the number of books that I've ordered recently that I am not just haphazardly buying books on the topic of gardening. I'm only purchasing those books that are connected in some way to a particular interest I have in gardening, or are suggested to me by someone, or that strike my fancy or that I found through a reference in another book or, well... there are a couple of books that I bought that I haven't quite figured out what caused me to purchase them. In some ways, this is also how I garden. I buy plants I have a particular interest in or are suggested to me by someone, or that strike my fancy or that I found through a reference in a book or catalog or well... there are some plants that I bought that I haven't quite figured out what caused me to purchase them. Don't we all garden this way? In some cases, someone else sowed the seed of the idea of a particular book I purchased. That's how I came to acquire the remaining volumes of a set of books called "The Garden Library" published by Doubleday, Page and Company. I somewhat randomly purchased two or three of the books in the set years ago, including The Flower Garden by Ida Dandridge Bennett. I didn't really think about buying the whole set, because I never knew how many books were in the set. Then a reader sent me an email a few weeks ago saying she had the whole set and had just donated it to a botanical garden and would I like to correspond with the person who had accepted the donation. Yes, I would, just to find out what other books were in the set and how many books were in the complete set. She replied that she'd written down all the titles and authors and provided me with the list. I did what anyone would have done. I worked down through that list and found all the remaining books from various booksellers and purchased them one evening. Merry Christmas to me. I received the last book, House Plants and How to Grow Them by Parker T. Barnes (1910) a few days ago. In other cases, one book provides a branch to another one, as is the case with my recent purchase of two books by Canon Henry N. Ellacombe. I can go right to the passage in Gardens in Winter by Elizabeth Lawrence where she mentions reading Ellacombe's books to see what was blooming in his garden after she had explored her own garden in a given month. I could not resist finding and buying these books, once I knew that Lawrence referenced them in her book. And so it goes. Like a gardener in May who buys one plant after another while others look on and wonder where she will plant them all and if she will have time to plant them all, I am a reader in December who buys one book after another, while others look on and wonder where I will put all these books and if I will have time to read them all. Somehow, like the gardener in May, I'll figure it out. In the meantime, I just received In a Gloucestershire Garden by Canon Henry N. Ellacombe (1895) which is based on "certain papers... which were published in the Guardian during the years 1890 - 1893". The original owner of this book, Agnes O. Kennaway (not sure of that last name) signed and dated it on August 7, 1895. What can I learn from a book that is almost 120 years old? Ellacombe is not teaching me how to garden, he is teaching me to love my garden, to look at it differently, to enjoy it in new ways. He reminds me, "December is not the month for the full enjoyment of the garden; it is the month of pleasant memories, and it may be also of pleasant anticipation". I think December is also the month for buying gardening books. After the holidays, I plan to enter my new-to-me gardening books into LibraryThing, which I use to keep track of all my gardening books. Then I'll take stock of the shelves of book throughout my house to see where I can put these new books, just like I would take stock of my garden in May to see where I can plant new plants. I'll read through these gardening books, too, and pass along any special passages I run across, just as I would share a special bloom from my garden. After all, according to Ellacombe, "the best gardeners are the greatest readers". 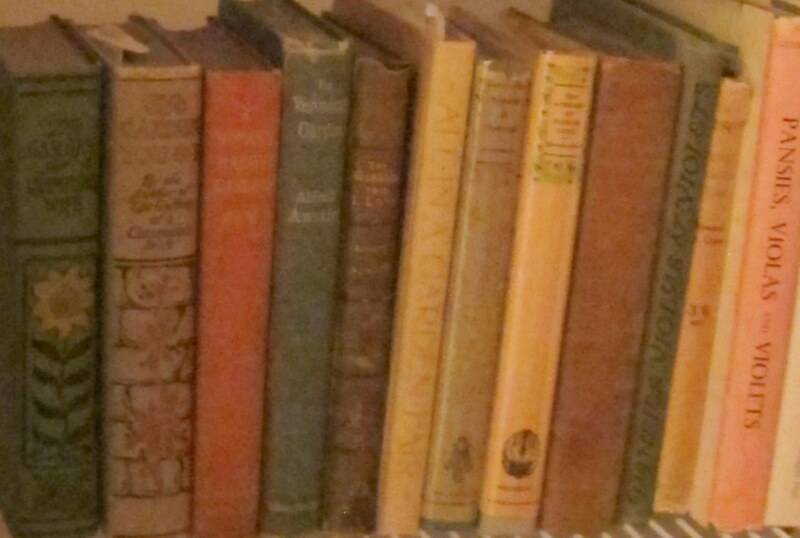 I love old books...mainly old hardback classics. I go to a lot of used book sales and garage sales. I'm going to have to get out of the Classics section and go look at some old gardening books, I see. There's treasures I am missing, my education is lacking. Great post, and thank you so much for the recommendation! My copy of "Gloucestershire Garden" arrived a couple of days ago and it is just the right book to curl up with in front of the fire. Why do you have Hellebores: A Comprehensive Guide on your library list twice? Do you have two copies? Just curious as I collect books also and was looking over your collection. I applaude your efforts. I have quite a collection of old books, but I usually aquire them at library book sales, although I have searched out a few on my own. My mother shook her head when I showed her my copy of Five Acres and Independence by Kains (1935). "just like your grandfather!" This was an amazing insight into my grandfather who shortly thereafter bought himself, and his son, 300 acres on Lake Champlain to farm. I too love gardening and am very much interested in gardening books too.Gardening books are of great help...your post is as interesting as you.Loved it!